Hendrik G. Geertsema (b. 1940) studied theology and philosophy. His Phd. thesis connected these two fields: Van boven naar voren. Wijsgerige achtergronden en problemen in het theologische denken over geschiedenis bij Jürgen Moltmann (1980). (From upward to forward. Philosophical background and problems of Jürgen Moltmanns theology of history). 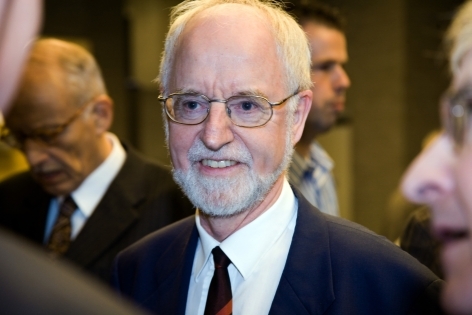 He specialised in the philosophy of Herman Dooyeweerd, but his interests cover a wide range of topics: from the philosophy of mind to philosophical and theological hermeneutics, from the relation between faith and science to social and political philosophy, from analytical philosophers like Richard Rorty and Hilary Putnam to phenomenological thinkers like Heidegger and Gadamer. He taught at the VU-university in Amsterdam since 1970 with an interruption of 2 years. He was connected with the Dutch LAbri community from 1974 to 1984. He was professor of reformational philosophy at the state universities of Groningen (1984-2005) and Utrecht (1985-2005). He was holder of the Dooyeweerd-chair in philosophy at the VU-university from 1986-2005. At present he still takes part in the one year Master programme Christian Studies of Science and Society which he initiated together with dr. J.P. Verhoogt. 1997. Authority of scripture and authority in the church in a postmodern climate. This paper was originally presented in Toronto 1997. It was prepared for the proceedings. These are unpublished. 2008. Power and conflict in human relations. Tentative reflections from a Christian perspective. In: Philosophy put to work. Contemporary issues in art, society, politics, science and religion. Edited by Henk Geertsema, Rik Peels & Jan van der Stoep. VU University Amsterdam 2008,70-99. 2008. Wolterstorff and the philosophy of religion. About being and creation. In: Essays in honour of Nicholas P. Wolterstorff. Edited by Henk E.S. Woldring. VU University Press 2008, 51-60. Wolterstorff responds to this critique in the same volume pages 73-80. Higher education as service to the King. In: Critique and challenge of Christian higher education, Kampen 1987, 54-78. Also in B. van der Walt and R. Swanepoel, eds, Signposts of God's Liberating Kingdom. Perspectives for the 21st century. Volume 1. Potchefstroomse Universiteit vir Christelike Hoï¿½r Onderwijs, 1997, 31-56. Christian Philosophy: Transformation or Inner Reformation. Phil. Ref. 52 (1987), 139-165. Homo respondens. On the historical nature of human reason. Phil. Ref. 58, (1993), 120-152. The inner reformation of philosophy and science and the dialogue of Christian faith with a secular culture. A critical assessment of Dooyeweerd's transcendental critique of theoretical thought. In: S. Griffioen and B. Balk (eds), Christian Philosophy at the Close of the Twentieth Century. Assessment and Perspective. , Kok, Kampen 1995, 11-28. Faith and science in biblical perspective. Human responsibility before God. In: J. M. van der Meer, ed., Facets of Faith and Science. Volume 4: Interpreting God's Action in the World. Lanham, The Pascal Centre for Advanced Studies in Faith and Science/ University Press of America, 285-312. Authority of Scripture in a (post)modern climate. Paper delivered at the international conference about hermeneutics 'Trust and Suspicion', Toronto 1997. 20 pp. Unpublished. Review of James K.A. Smith, The Fall of Interpretation. Philosophical Foundations for a Creational Hermeneutic. In: Phil. Ref. 66 (2001), 219-221. Which causality? Whose explanation? In: Studies in Science and Theology. Yearbook of the European Society for the Study of Science and Theology. Volume 8 2001-2002, 217-235. Revised version in Phil. Ref. 67 (2002), 173-185. 'Improvable nature?' Some meta-historical reflections. In: Is nature ever evil? Religion, science, and value. Edited by Willem B. Drees, Routledge, London and New York, 2003, 173-178. Analytical and Reformational Philosophy. Critical Reflections regarding R. van Woudenberg's Meditation on 'Aspects' and 'Functions'. In: Philosophia Reformata 69 (2004). 53-76. Dooyeweerd on knowledge and truth. In: Ways of Knowing in Concert. Edited by John H. Kok. Dordt College Press, 85-100. Cyborg: Myth or Reality? In Zygon, 41, (2006), 289-328. Power and conflict in human relations. Tentative reflections from a Christian perspective. In: Philosophy put to work. Contemporary issues in art, society, politics, science and religion. Edited by Henk Geertsema, Rik Peels & Jan van der Stoep. VU University Amsterdam 2008, 70-99. Wolterstorff and the philosophy of religion. About being and creation. In: Essays in honour of Nicholas P. Wolterstorff. Edited by Henk E.S. Woldring. VU University Press 2008, 51-60. Knowing within the context of creation. In Faith and Philosophy, 25 (2008), 237-260.